First off, can I just say a big thank you to all of you who have participated in the Sliced Coins Quilt Along so far?? This quilt along has been so much fun, and I hope you've enjoyed quilting along with me, too. I am so excited to see your finished quilts! Do you have a finished quilt yet? You do? High five! Link it up below for a chance to win a $25 gift certificate from Sew Fresh Fabrics as a special thank you for participating in my first ever quilt along. If you're not all finished just yet, that's A-OK, this drawing will be open until 2/27, so you've still got some time to wrap it up. Come on back over and link up as soon as you're done, and I'll announce a winner first thing on 2/28. Good luck! This is the final week in the Sliced Coins Quilt Along. Have you had fun? I sure hope so, I know I have. I'm so proud of all the amazing finished quilt tops I'm seeing for the quilt along! It makes me so happy to see how many people are participating and how much they're enjoying this quilt pattern. A part of me really likes making quilt backs, trying to use up scraps from the quilt top and making them work in a new way. Another part of me dreads making quilt backs, because sometimes it feels a little bit tedious to me. I've done a lot of different things for quilt backs in the last year and I've also seen a ton of awesome ones on Flickr - here's some of my favorites for inspiration. Since you more than likely have extra coins, I went ahead and did some math for you all for a quilt back, to use up those excess coins and make a scrappylicious kind of quilt back. I've also PDF'd the instructions for you, to make things even easier, just click on the picture below to access the PDF. Now that you've got a quilt back, it's time to baste and quilt! Basting is my least favorite part of quilting! Jennifer wrote a really comprehensive basting tutorial during her quilt-along last year - That Girl...That Quilt's Basting tutorial - and I highly recommend it. As for quilting, I'm more of a free-motion kind of girl. Don't get me wrong, I like straight-line quilting, but free-motion quilting is relaxing to me. I would be perfectly happy putting my earbuds in, turning on my iPod, and free motion quilting all day. That sounds quite awesome, actually. I learned to free-motion quilt from Elizabeth Hartman's quilt patterns, they're very thorough, but the basic gist is this - practice the motif you want to quilt (i.e. loopy, stipple, circles, etc.) on paper first. Practicing on paper is really helpful, even if it feels a little silly. Randi wrote a fantastic free-motion quilting tutorial last year that will really help you free-motion, if it's your first time. If you're interested in straight line quilting, there's two great tutorials to see - Amy's simple straight-line quilting tutorial and Katy's wavy quilting tutorial. Both are very beginner-friendly. I can't wait to see how these quilts turn out! In fact, I'm so excited to see these quilts finished up that I'm going to hold a giveaway for those of you who finish your quilts! You'll be able to enter in the giveaway linky starting next Friday 2/18 and ending on Friday 2/28. I'll be giving away a gift certificate to Sew Fresh Fabrics for $25 to a lucky random winner. Thank you, Peg & Becca! Need some fabric now? They're running an awesome free domestic shipping special for orders over $35 right now until 2/14 to share the Valentine's love! Sliced Coins Quilt Along: Let's see those quilt tops! How are you guys doing with the quilt along? I've seen a lot of finished quilt tops popping up on Flickr, so let's share them all here. And stay tuned tomorrow for a quilt back pattern, as well as some tips and tutorials on quilting and binding. 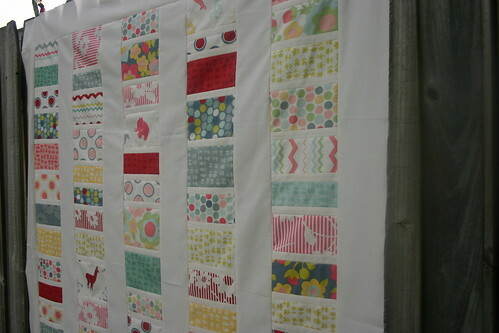 There will also be a nice surprise in tomorrow's quilt along post, so make sure to check it out! Sashing is one of those parts of quilting that I'm not a huge fan of. It can be a little boring, in my opinion, but I really love the look it gives to this quilt. Working with huge pieces of fabric is sometimes a challenge, but as long as you pin well, everything should come out just fine. First, you will be working on your A, B, and C coin stacks, which should be the three stacks on the left side of your quilt. Grab a piece of your sashing to match your coin stack and pin your sashing strip to the left side of the stack. Pin well. I like to pin at my seam allowances. Seam together using a 1/4" seam allowance. Do the same for your B and C stacks as well. Press your seams. For your final coin stack, you'll be adding a piece of sashing to both the right and left sides (for a total of 5 pieces of sashing). This should be coin stack D. Again, pin and use a 1/4" seam allowance. Press your seams. As you sew your stacks together, make sure to watch your seams, particularly if you have pressed your seams open. Next, begin joining your sashed stacks together. Seam together stacks A and B with a 1/4" seam allowance and do the same for C and D. Make sure your stacks follow this pattern - sashing, stacked coins, sashing, stacked coins, sashing, stacked coins, sashing, stacked coins, sashing. Your quilt top should begin with sashing on the left and end with sashing on the right. Press all seams. When you're done with this step, it's quite possible you may need to trim your top or bottom to give an even clean edge. Feel free to do that if need be. The final step of sashing this quilt is sashing the top and bottom. Add a strip of sashing to both the top and bottom, making sure to use a lot of pins to keep everything straight. Seam together with a 1/4" seam allowance and press seams well. Voila! A finished quilt top!! Make sure to come back next Thursday to show off your progress. I can't wait to see these gorgeous quilt tops! Next week, we'll be talking about quilt backs and quilting. If you want to get ready for this step, I suggest you get together all of your scraps from this quilt and see what you've got. It's quite possible you may have enough to piece together a quilt back from just your scraps. You may also need to supplement your scraps with some additional fabrics. Also, make sure you have the batting for your quilt. Have a great weekend! Sliced Coins Quilt Along: Link up your stacks! It's time to link up your progress on your sliced coins quilts, and don't forget you can still join in the quilt along fun. You can find all the details right here. This quilt is super beginner friendly and a great way to show off some of those gorgeous fabrics in your stash. Welcome to the second week of the quilt along. If you're just joining the quilt-along, please click here to visit the cutting instructions and here for the materials list. Now that you've got your fabrics all cut up, I imagine you're just dying to start putting your quilt together. This week, we're going to be laying out our coin stacks and adding our slices. Do you have a design wall? I do, but I actually didn't use it for laying these quilts out - it's becoming more of a landing strip for all of my works in progress at the moment. If you're interested in a design wall and don't have one yet, there's lots of options - a flannel sheet works great and so does the back of a vinyl tablecloth because they're usually flannel. Mine is a Fons & Porter Design Wall that I happened to get a ridiculous deal on. 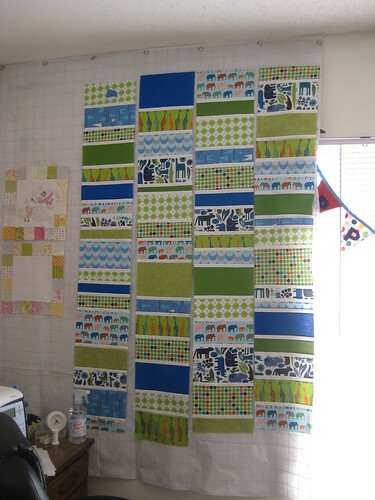 I highly recommend having a design wall, I don't know how I ever quilted without one! A table top can work well as a design space too! You can use a floor, or a sheet, or whatever works for you. Use a measuring tape to measure on your work surface how long your stack of coins ought to be. Use the figures, but keep in mind the math includes the slices, so you will need to trim your stacks when completed. For each quilt, you'll be putting together four stacks of coins. Play around with this. Mix up your fabrics and mix up your coin slices. 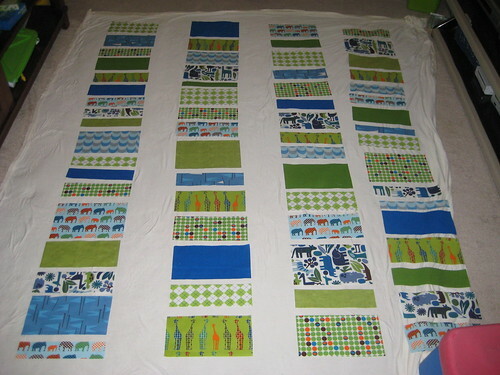 Don't get too caught up in the layout, though, your quilt is going to look fantastic! A sheet can make a great little "design floor"
When you're satisfied with your layout, stack your coins one on top of the other from bottom to top. Make sure to keep them oriented correctly, if any of your fabrics are directional. Your bottom coin should be at the bottom of the stack and your top coin at the top. Keep your rows separate. I used file folders to keep everything straight and labeled each folder in two ways - a row number or letter (I used letters) and a sticky note reminding me that the coins are top to bottom. 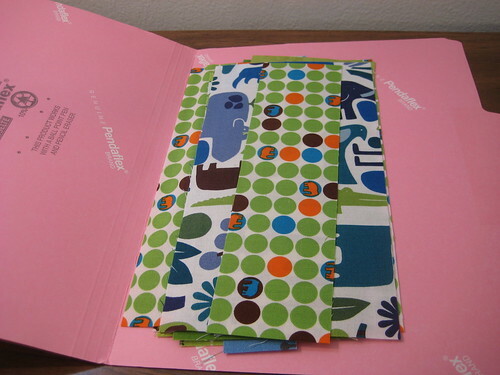 Next, take your file folders to your sewing machine, and grab a stack of your 1" neutral slices. Add a slice to the bottom of each coin, with one exception - do nothing with your bottom coin, which should be at the bottom of the stack. So, if you have 13 coins in your stack, you will add 12 slices. Got it? Keep your coins in order. I suggest chain piecing them, and laying them face down as you trim them from your chain to ensure they stay in order. 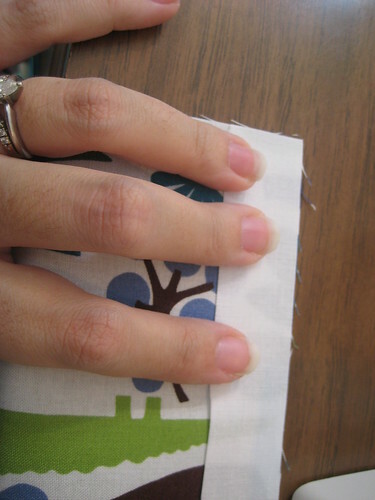 Next, finger press (or press with an iron, your choice) the seams you've just created on both sides. Lay your coins back in their file folder in order, with your top coin on top and your bottom coin on the bottom. Continue to chain piece your coins and slices together until your stack is complete. Your stack should start with a coin and end with a coin. Press the entire stack well and label with a small piece of painter's tape or masking tape with the letter or number assigned to the stack. I'm a press-seams-open kind of girl, but you do what you are most comfortable with. Set aside your completed stack and grab the next file folder to do it all over again. When you're done, you'll have four completed stacks. Their lengths may vary slightly - don't worry about that right now, we'll fix them up and make them even next week. Sliced Coins Quilt Along: Show off your cutting skills! Are you participating in the Sliced Coins Quilt Along? Did you write about it on your blog this week? Link it up here, show off your beautiful stacks of fabric, all cut up and ready to sew together. How about a work-in-progress picture to get us started? Tomorrow, I'll be sharing how to create your sliced coin stacks, so get those bobbins wound and get ready for some sewing! I cannot even begin to explain how excited I am about getting started on this quilt-along today! Today, we're going to start cutting into that beautiful fabric I've seen you all collecting on Flickr. By the way, it's not too late to join in the quilt along fun! Grab a button from my sidebar, join the Flickr group, and let's get started. Now, remember, there are three different quilt sizes we're talking about here, so there's three sets of cutting instructions. Here we go!! Cut your fat quarters into three strips along the longer, 22" side of your fat quarters - two measuring 9 1/2" each, and the other being your excess. Hang onto your extra strip, you may want it later, depending on how big it is. 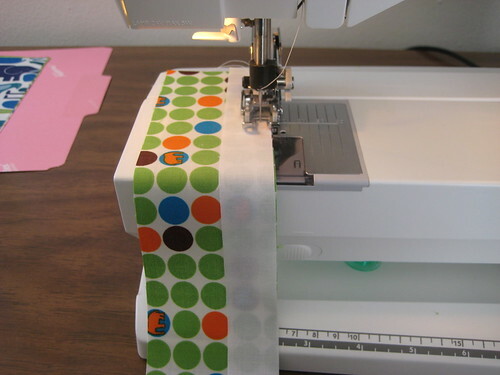 Cut your fat quarters into two 10" wide strips along the wider side of your fat quarters, which should be 22". Hang onto your extra strip, you may want it later, depending on how big it is. If you're using a layer cake, you won't need to make these strips, skip right to the next step. Once you have your strips, the instructions are the same for each quilt. You will now make your coins, by cutting your strips into randomly sized pieces. Here's how I did it - I made five different sized coins, 8", 5", 4", 3" and 2". You can choose whatever sizes you would like, and in fact, you can stagger the sizes depending on the size of the print on your fat quarter. Try to keep your coins stacked together with like fabric (despite the difference in sizes) for layout purposes. For the baby size, you will need approximately 35-45 coins. For the crib size, you will need around 55-65 coins. For the lap size, you will need around 60-70 coins. You will wind up cutting more than this, and we will use the extra coins to piece together a quilt back. From what remains, cut into 1" strips, then cut those down to 1" x 9 1/2" pieces. These will be your slices for your coin stacks. Make sure to have at least as many as you have coins. From what remains, cut into 1" strips, then cut those down to 1" x 9 1/2" pieces. These will be your slices for your coin stacks. From your remaining sashing, cut 1" strips, and then cut those strips into 1" x 10" pieces. These will be your slices for your coin stacks. Want a sneak peek of how your finished top is going to look? Here's my boy twin sliced coin quilt top. I can't wait to get started next week! There's still to join in - grab a button and join the Flickr group. Stay tuned next Friday for cutting instructions, and if you missed the details on the needed materials, check here. Welcome to my very first quilt along, the Sliced Coins quilt along! I'm super excited to get started and I hope you are, too. 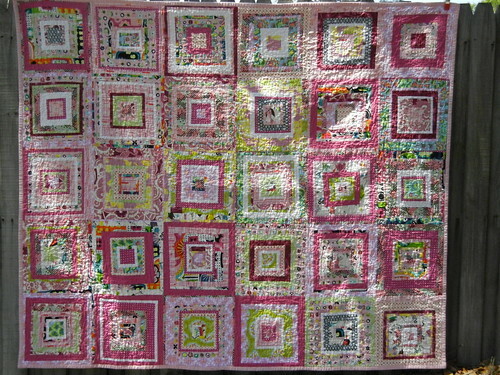 I'll be posting on Fridays, starting in two weeks, on 1/21/11, sharing each step of making this quilt. This should give you some time to either do some fabric shopping or to dig through your scraps, as this quilt would be an awesome use for scraps! Earlier this week, I started up a Flickr group for us to share fabric choices, show off progress, and get to know each other. Scoot on over and join the group, and show us your fabric auditions! Feel free to join even if you're not sure you're going to participate right away. You can always sew at your own pace! Non-slip Ruler - I'm a big fan of the Omnigrip rulers, but really any ruler will work. I recommend a ruler that is at least 24" long, for ease of cutting. Cutting Mat - I use a 24 x 36 and find that it meets all of my needs quite well. Baby - 36" x 48"
Crib - 54" x 57"
Lap - 66" x 76"